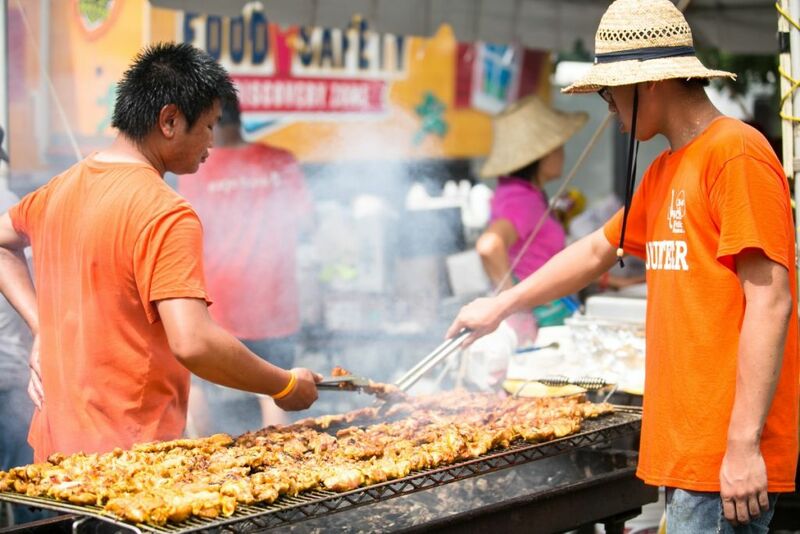 Come and savor the many tastes of Lowell’s ethnic cuisines. The tempting aromas of Greek, Polish, Asian, Latin, Burmese and so many other foods, promise a culinary and cultural experience. Non-profit ethnic organizations, mostly local, come together to prepare and sell the foods of their heritage. Their proceeds benefit numerous worthy projects and programs. As you enjoy these delicious foods, know you are supporting “green” concerns (paper plates and bio-degradable utensils only) and good causes. In many cases, the volunteers in the booths include family members. Sossy Jeknovorian, of the Armenian Relief Society, recently brought her 96 year old mother to an ethnic meeting. Her mother had served for many years as a festival volunteer. This group, located at JFK Plaza, is also a long time veteran of festivals. A story that might be part myth tells of some women from the Society, who, in their pursuit of grape leaves, aroused the curiosity of some law officers, but all ended well. In addition to stuffed grape leaves and other Armenian traditional food, there is the popular losh kebab sandwich. The group typically makes about 2000 of these appetizingly spiced Armenian hamburgers. The Lao United Church of Christ ethnic food booth has been a fixture at the JFK Plaza. Menu items include Crab Rangoon, egg roll, chicken wing and a generous combination plate. Ted Rasakham, the longtime chair of the group has expressed appreciation for the chance to be part of the festival. Reflecting the ancestral home,the Azores, of many Portuguese immigrants to Lowell, the Portuguese booth at JFK Plaza, under the banner of the Portuguese American Veterans, prepares pasteis de bacalhau (cod fish cakes) and polvo guisado (octopus stew w/rice), but grilled items such as linguica are also on the menu. Paolo Godinho, chair of the group, and other volunteers have a long record of participating in the festival. According to Melissa Gannom, chair of the Hellenic American Academy PTA booth at Boarding House Park, “The Folk Festival enables our school community to re-connect with alumni and fosters new relationships with our parents as well as others in the community.” Food favorites on the menu include gyro sandwiches, lamb skewer, grape leaves, and baklava. The Lowell Latin Catholic Community of St. Patrick’s Parish booth is located on a corner at Boarding House Park. St Patrick’s Church, a special place to the early Irish, is now a mission church for more recently arrived folks from the Latin countries. This ambitious group has two menus, one for Friday night, the other expanded one for Saturday and Sunday. Some popular Hispanic dishes include arroz con pollo, habichuela y ensalada, and papa rellena de carne(meat stuffed mashed potato ball. Margarita Reyes and Mercedes de Pina are volunteer leaders. Another Boarding House Park established group is Wat Lao Mixayarm (Wat meaning temple). Kevin Camvan has served as chair of this group for many years, even in the years he has had to travel to Laos. Popular items include BBQ Chicken Wings, BBQ Beef Teriyaki, and the Wat Loa Mixayaram Special. Holy Trinity Greek Orthodox Church is one of the pioneer groups at JFK Plaza. Lamb, of course, and other Greek traditional food can be found in this Greek booth. Rumor has it that about 1,500 pieces of baklava are usually prepared for the festival. Joan Metropolis, chairperson, was really nervous the first time she gave an interview on the stage at JFK, but now is a seasoned veteran as she responds to questions about her Greek heritage and the traditional food on the menu. Mitt Chanthavong, chair of the Wat Buddhabhavana Laotian booth at JKF Plaza, in recognizing the 11 years that his group has participated has been happy that the festival, “Brings all people together and the community together….and makes money for his temple.” Vegetarian egg roll, papaya salad, chicken BBQ, and fried rice are some of this booth’s offerings. Christ Jubilee International Ministries, an African group is participating for the third year at the Dutton Street site. 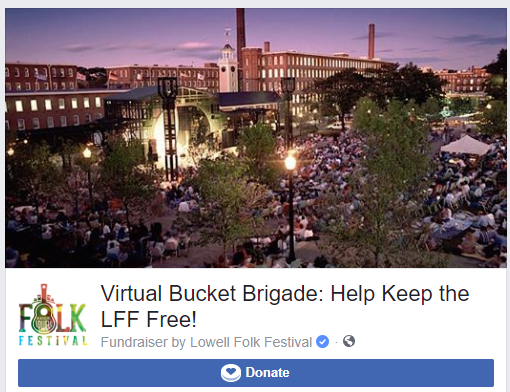 Yvonne Haggard, chair of the group, has mentioned that, “The Lowell Folk Festival means a lot to our group….Christ Jubilee International Ministries is very appreciative of being part of this great and historic event. We showcase our group, meet other wonderful people, sell our food, buy and taste other delicious food.” The menu includes toborgee with rice (beans & kitterly, collard green w/rice, pumpkin/squash stew w/rice. For as long as the Dutton Street site had ethnic food booths and in a previous site, Kai Zornlai has worn her conical straw hat. She has been Buddhachak’s chairperson for many years and can be seen preparing some of the Southeast Asian food dishes. Popular items include vegetable spring roll, Pad Thai, and mango fried rice. New last year, the Dutton Street Dance Pavilion welcomed FEALMA, a local Brazilian group, as a first time participant. Joao Lopes and his fellow volunteers plan to sell Cachorro-quente, Esptinho de Frango Empanada, and Pastel de Queijo. The New life kingdom International Ministry, many of whose members hail from Sierra Leone, will be at the newly reconfigured Market Street stage site. This is their first Lowell Folk festival and Philip Jamina, is enthusiastic about grilling African BBQ chicken and ribs. Cassava leaves and Jollof rice are other items on the menu.